I'm trying to install WFastCGI 2.1 Gateway for IIS and Python 3.4 via the Web Platform Installer. Python Installer fails with the error: "This product did not install successfully: Downloaded file failed signature verification and may have been tampered with". 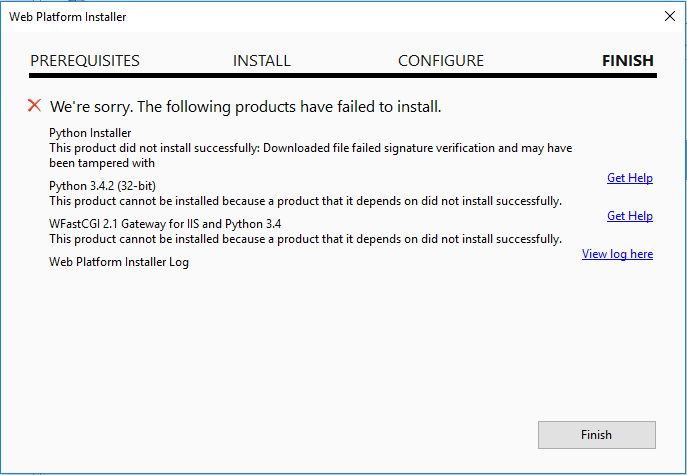 Python 3.4.2 (32-bit) and WFastCGI 2.1 Gateway for IIS and Python 3.4 subsequently fail with the error: "This product cannot be installed because a product that it depends on did not install successfully". I noticed that the direct download link in the prerequisites tab launches this URL, which explains that pytools has been migrated to PTVS. Maybe this is part of the problem? I'm following this tutorial about deploying a Flask web app on IIS. Please help me find solutions to make this installation successful or provide alternatives that will allow me to deploy on IIS. Thank you! I try to reproduce the issue on my end and I got the same error. 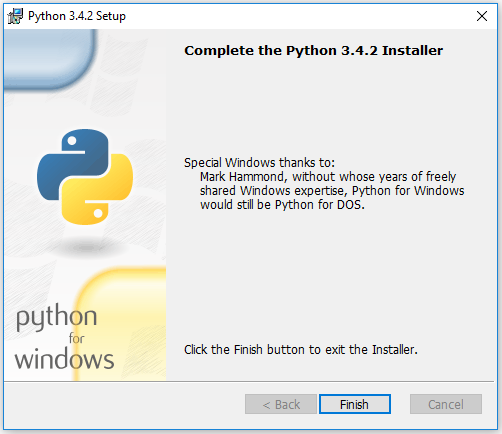 I also try to install Python 3.4.2 (32-bit) and WFastCGI 2.1 separately but it also failed. It looks like some issue with the Web Platform Installer. So I try to install the MSI version of Python 3.4.2 (32-bit) from link below. So I suggest you to download the Python 3.4.2 from the link to work around this issue.